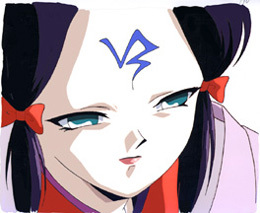 The Details: Vampire Princess Miyu is notable as one of the bleakest series. The sheer overwhelming bleakness is piled on so thickly that it inevitably becomes funny. Once when I marathoned it for friends, we got to the kitty shinma episode. 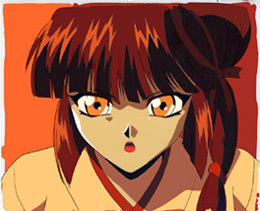 In the beginning, Miyu (in her cemetery home with Larva and Shiina) commented that a tall apartment building was blocking her view of the moon. Shortly afterward a man jumped from a high balcony, killing himself. Miyu decided that perhaps the view wasn't so bad after all. Laughter arose in my living room, accompanied with comments of "This is sooo bleak!". Heh, yep. About the only complaint I could make the first time I watched Miyu was that it was too predictable in that you could always assume the worst. Then they tricked me by letting a few things go well, so that complaint was invalidated. The series was no longer predictable, because there was a slim chance in hell that occasionally something would work out for the best. Maybe! Up next: Another Miyu, another Reiha, and a Chisato. Comments: Young Reiha and Matsukaze. In the previous episode we finally saw a lot of why Reiha has such a strong dislike for Miyu. In this flashback, we see the first time she uses her powers as a snow Shinma. She and Matsukaze had been walking through the forest and stumbled across a feeding Shinma. Using her powers was necessary, or Reiha would have died. There would be another layer of a snow flurry over this cel. Comments: A lovely fire-lit close-up of Miyu. Comments: Larva, with a lilac hue. Off-colouring seems to reduce the value of Larva cels, but I personally love off-colour, monochrome, and duotone. And these shades go so well with him! 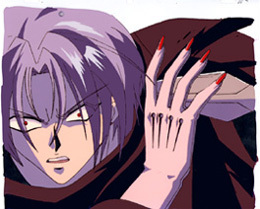 I also love his hands, so this cel is even more a treasure for me. There seems to be a tiny bit of paper stuck to the cel, near the top of Larva's hair. It's been there for as long as I have had the cel, and I have been too cowardly to try to remove it. I'm not sure about the sequence #, as it looks more like an E than a digit. 5? 3? Comments: Larva, in his mask. When he was first shown without his mask, I was pleased to see the pretty shinma under it. 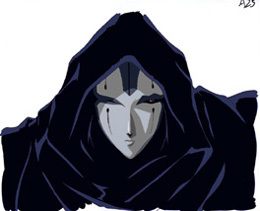 I like him in the mask as well, though, and this cel of it looked particularly nice to me. I love the one red eye! Comments: Larva, with his scythe! 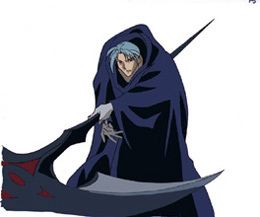 I love this cel, partially because I wanted one that showed his scythe, partially because of his bright red eyes, and partially because the layout simply looks interesting to me. The non-matching sketch is of a ball, and seeing it never fails to get me singing "Man' Maru Temari Uta". Comments: Larva and Miyu. It's an essential (or so I think) to have a cel of them together. Their relationship is kind of touching, in a strange way. I like to think of them as bonded because fate had them gush blood all over each other. 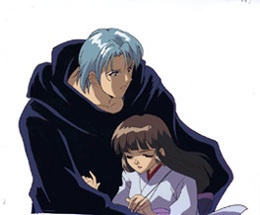 *shrug* Next, maybe I'll come up with a cel of masked Larva and Miyu together. Though right now I probably want a good Shiina with them, more than anything else. Comments: A Reiha close-up. I need to get a not so close-up of her that favours Matsukaze now, though he's a somewhat obnoxious (psychotic!) doll. 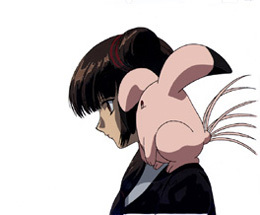 Comments: I may not have a good cel of Shiina with the gang, but here's a profile of Shiina and of Miyu's head. Shiina is an adorable little thing, but you need to see the big bloodshot eyeball to fully understand the cuteness. There is some line fading in this cel.